[Casting News] StarWarsGeek’s Exciting New Promotions | The Fighting 1:18th! 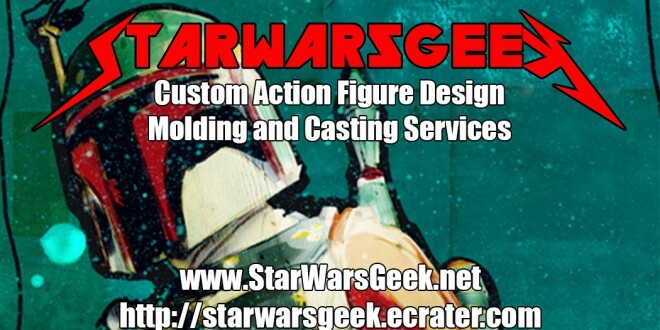 We have some “Hot Off The Truck” news from Fighting 118th Officer, Artist, and Caster StarWarsGeek. Just posted today from the man himself, this news includes his upcoming specials. Take a look below at what SWG has in store for us. “First of all, I just added 40+ new items to my store, including my highly anticipated “VooDoo kit” (VooDoo Priest kit) sculpted by Jason Hendricks. This new kit contains all the pieces and accessories you’ll need to create your own VooDoo Priest character, including a jacket, hat, cane, coffin, and several other items. It’s available for pre-order starting today for just $25 plus shipping. Unlike the rest of my inventory, these will be sold on a per-order basis, meaning that once you place your order I will make your kit. I didn’t want to have a bunch of kits sitting around waiting to be purchased because it’s a little bigger then a head. I’m going to start adding more and more new products on a regular basis. I’m shooting for a weekly update of new items. That’s right, I said WEEKLY. Each week, I’m hoping to have a handful of new items ready to be added for purchase every Monday. It might be 4 or 5 one week and 15 the next week, but I’m going to add SOMETHING new every week. I’ll preview it here on Facebook first, and then add it to the store within a few days. So if you want to get the sneak peek look at it, make sure you like this page. The new VooDoo kit is just the start. It’s the first in an entire line of kits. At first it will be add-on kits, so you will need to supply a base figure, but complete, full figure kits are in the works and should be available shortly. On top of that, I’m also pleased to announce that I’ll be creating my own ‘exclusive’ items for sale. Some of them will be original sculpts, while others will be kitbashed items from different existing heads. Either way, the only place you’ll find them is here at my shop. I’ve added a few to this week’s update so you can see what kind of items I’m looking at producing. 1) $50 store credit giveaway EVERY MONTH! That’s right, each month, I’m going to give a $50 credit to one of my customers. How do you enter? Easy. Just make a purchase. You will get one entry for every purchase you make. One entry per day, per person. Doesn’t matter how many items you buy, just the purchases. So if you make a purchase on the 1st, 11th, 15th, and 23rd of the month, you’ll have 4 chances to win the $50 credit. That’s $600 a year I’ll be giving away in credit to my store, and all you have to do is make a purchase! 2) #WackyWednesdays begin TODAY! What’s “Wacky Wednesday” you ask? Well, for every order that’s placed on a Wednesday, I’ll match your order with random items. What does that mean? Let’s say you purchase 4 head casts on a Wednesday… I’ll put 4 random head casts in your order when I ship it. NOTE: the free items are totally random. You can not choose what items you will get for free. Sorry. 3) #AlmostFreeShit – Not free, but… almost. I’m going to start posting random items, at random times, for 0.20 each. Why 0.20? Because that’s the lowest price eCrater will allow me to put for an item. Stupid, I know. But what can I do. It’s still like 90% off my regular prices. But I’m not telling you when it will be posted. I might drop a hint on Facebook or Twitter, so you might want to make sure you’re keeping track of my pages. I’ll probably do 5 items at a time, so it will be a $1 total cost for all of them, plus shipping. 4) Facebook/Twitter/Forum giveaways – YES, I’m going to start giving away items thru various avenues, more than likely it will be painted items, as I really want to start painting some of the heads and parts from my store so that I can post a picture of a painted item next to the casted item. It’s hard to tell details sometimes on the unpainted casts, so I’m *hopefully* going to get some stuff painted real soon. And once I do, I really won’t have any use for 99% of them, so I may as well give them away… right? 5) International customers – I’ve already mentioned this, but I had to remove the International shipping options on the eCrater store. That doesn’t mean I’m not shipping International though. There was an issue with the shipping calculator and I was losing too much money on every shipment. So, going forward, if you live outside the US and want to place an order, just contact me. Message me here, email me, contact me thru www.starwarsgeek.net or any other way you can get in touch with me, and I’ll take care of it. 6) Painted items – I had to remove the painting service from my webstore, because I have a ton of stuff that’s been paid for that I still need to catch up on. That said, once I do get caught up, I’ll be putting my painting service back up and taking new commissions for painted items. But I’ll be keeping tabs on it, and taking it down to play catch up as need be. But don’t worry, I’ll always put it back up… eventually. So if you’re not good with painting but want to get your hands on some of my items, I’m always available to paint them for you. Any questions or comment, please don’t hesitate to contact me either here via PM or thru my website via email. There you have it. You can find all of StarWarsGeek‘s updates in his Original Thread.